When Buffett sits on more than $50 billion, it's time to worry about corporate America's enormous cash pile, Leonid Bershidsky says on Bloomberg View. When Warren Buffett has more than $50 billion he cannot find a reasonable way to invest, it is time to worry about corporate America’s enormous cash pile. This surfeit no longer signals uncertainty, but a lack of reasonably priced acquisition targets. At the end of last year, U.S. non-financial companies held a record $1.94 trillion in liquid assets (mainly cash and money market or mutual fund shares). The latest Federal Reserve data — from the end of the first quarter — show a somewhat slimmer cushion of $1.85 trillion, the result of companies paying out fat dividends and running generous share buyback programs. Even so, the stock of liquid assets held by U.S. corporations is up 34 percent from 2008. At the end of that year, Berkshire Hathaway had less than $26 billion in cash and equivalents. By now, however, the words “ample cash” are too weak to describe that part of the company’s balance sheet. 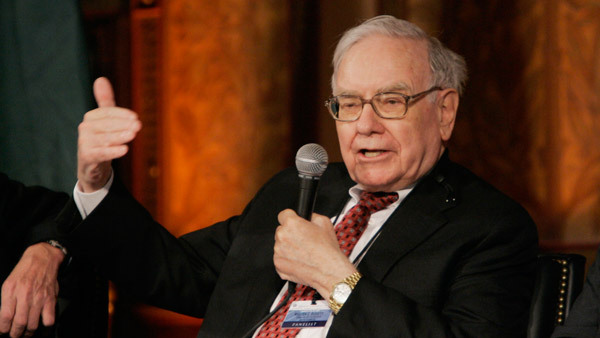 Berkshire Hathaway has never been so awash in cash. Buffett doesn’t need $55.4 billion to make sure his insurance business can pay out any possible claims. The transaction motive can’t account for such abnormal cash accumulation, either. So how about the speculative motive? Buffett, after all, is better known as an investor than an operational manager. In 2013, Berkshire Hathaway spent $18 billion on two major acquisitions (NV Energy Inc. and a share of HJ Heinz Co.), and added $3.5 billion worth of shares in existing investments, while the company’s subsidiaries made 25 more deals for a combined $3.1 billion. Still, the cash mountain kept growing. Roughly the same is happening at other large U.S. companies, with the biggest of them accumulating the most cash. According to a June report from Standard & Poor’s, the largest 18 of the 1,800 companies the ratings agency studied controlled 36 percent of the group’s cash and short-term investments. S&P believes that U.S. corporate tax policy is at least partly responsible for this accumulation: Overseas cash accounts for 83 percent of the total cushion built up by corporate America’s top 1 percent. One might think the big holders of this overseas cash — Microsoft, Google, Apple, Cisco Systems, Oracle, Pfizer, Johnson & Johnson, Coca-Cola and the big car companies — just aren’t finding suitable acquisition targets overseas and prefer to sit on the money than pay the taxes involved in repatriating it. There is, however, a simple way to move the cash into the U.S. and save on taxes in the process. Corporations borrow billions of dollars at home and then service the debts with the overseas cash, a process that S&P calls “synthetic repatriation.” The geography of the cash holdings is important mainly for accounting purposes. A better explanation is that lax monetary policy in recent years has allowed big corporations to make a lot of cash (demand stimulus at work), but that decision-makers in these companies are not yet accustomed to the decreased value of money that implies. Current company valuations, especially in the tech sector, are OK for buyers who themselves have overvalued stock, but not for long-term investors such as Buffett or cautious corporate managers such as Apple’s Tim Cook. There simply aren’t enough big acquisition targets available at acceptable prices to deplete the cash piles. So a fourth motive for corporations to hold onto cash should be added to Keynes’s three: the inability to spend it. Dividends and buybacks are just about the only reasonable alternatives open to the cash-rich companies — expect more of them.